Elvis attends a press conference in the Rainbow Rib Room of the Hilton's Hawaiian Village Hotel. There he announced the concert would take place on January 14, 1973. It would be a benefit for the Kui Lee Cancer Fund. 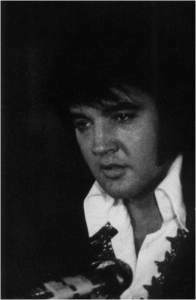 Elvis and the Colonel would start the benefit by donating a check for $ 1,000 to the Kui Lee Cancer Fund. RCA joined Elvis & the Colonel by also donating a check for the same amount.